Christ Our Savior L.H.S. works career education into its educational curriculum. We strive to give our students a well-rounded education that prepares them for for life beyond the doors of high school. 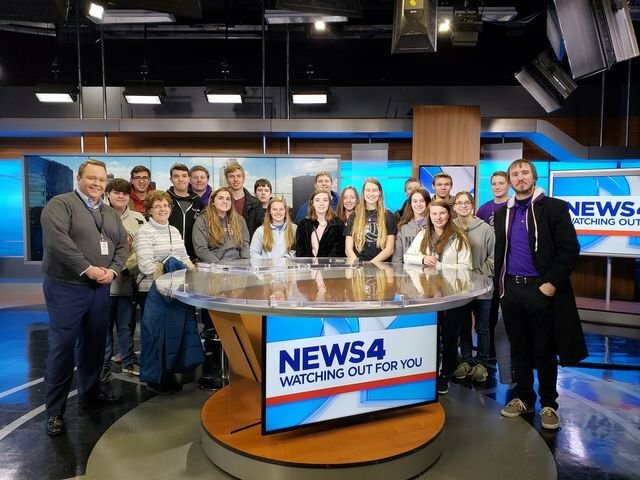 Recently, COSLHS students spent a day exploring different types of careers that are available in our area. Next up was the Federal Reserve. They took part in a program called "Inside Economy at the Federal Reserve" which taught them not only how our local economy works, but the global economy. An exercise they participated in exposed them to buying and selling commodities in real time. Students worked at computers watching the fluctuation in market prices and had to make decisions about when was the right time to sell their product or when was a good time to buy. Everyone was excited to learn they were going to get to take home a bag of money at the end of the day, until they realized it was shredded. We all know you have to work to bring home the real money. After lunch at Ballpark Village, students traveled back to Waterloo for their final stop. The Life Network of Southern Illinois introduced students to a career path that wasn't as much about the big money, but big hearts. They gave a great presentation about what they do to help preserve the lives of unborn babies and support families that have chosen life. Staff said it is a job of great satisfaction knowing that you are helping people and doing something that you believe in. The final message to our students was to know that some people prefer having a career that makes a positive impact in other peoples lives rather than just working for making money. What a great day of seeing different types of career opportunities and learning what motivates us to choose a type of employment.